Verbum Dei missionary Dr Maeve Louise Heaney found a mentor and friend in Jesuit Father Michael Paul Gallagher, who died on November 6. Dr Heaney writes this personal tribute to a man always on her side. Those who have taken a theology unit with me during the time I have been teaching at Australian Catholic University will recognise these words, invariable and essential instructions for any essay I will accept and correct. What they may not know is that I did not invent them, but am passing on, or trying to apply learnt wisdom from the person – Jesuit Father Michael Paul Gallagher – who accompanied nearly all my postgraduate work and remained a mentor and friend until he returned to the Father earlier last month. These apparently simple words reflect much of who he was and what I admired: find your question; trust your concerns; pull the thread of your own life; and, with due attention to others and all that is wise and good in the Church and this world, trust yourself and the intuitions God has placed in your heart and mind. 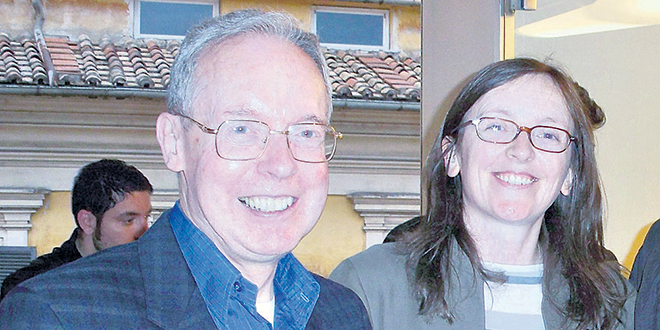 Fr Michael Paul Gallagher was an Irish Jesuit, although I met him while at the Pontifical Gregorian University in Rome, where he gradually became the director of my licentiate thesis, my doctoral thesis, and an ongoing mentor, albeit from time to time and at a distance. Born in Sligo and fluent in the Irish language few realise is so different from English, his life unfolded as an interweaving of natural intelligence, deep spirituality and unpretentious humanity, with an appropriate but wicked sense of humour. Michael Paul entered the Jesuits young, studied Renaissance Literature in Oxford and theology at Queen’s University, Belfast. He taught English Literature for many years at University College Dublin, one of Ireland’s biggest universities, before being called to Rome to assist the Pontifical Council for Dialogue with Non-Believers and teach at the Gregorian. There he went on to serve as the head of fundamental theology and later dean of the faculty. His was an apparently outstanding academic career, one would say, and yet it is precisely his freedom to follow his own thought and concerns, to be the theologian he was meant to be, that I am most grateful for and will hold as the deepest lesson learnt. It is easy to be distracted from oneself, in the demanding world of education; hard not to dedicate oneself to that which is important, while overlooking that which is essential. Michael Paul was, quintessentially, himself – and that, paradoxically, made him so very “useful” to others. With an eagle’s eye for grammar, Michael Paul corrected commas and colons and accepted no padding in the work we gave him, challenging every attempt at pompous jargon with a simple “meaning …?”. This is the person who taught me to trust my own thought, to find my own questions and to bring music and creativity into the heart of my theological thinking. He was always supportive, never invasive, quiet, discerning, passionate about that which matters; suitably dismissive of that which does not. You had to be a self-starter, I think, to work with him, but if you were, he somehow knew how to give just the right amount of space and presence to let things happen. He was best known internationally for his work on faith and culture, encapsulated in his book, Clashing symbols: An Introduction to Faith and Culture, and his inspirational gift of communicating. I believe these two have the same foundation: a capacity to sense God at work in the people and world around him, and back it, with a gentle openness that was ahead of his time, at once audacious and faithful. It was here I most clearly recognise the Ignatian spirituality he incarnated – his gift of discerning what was of God and what was not. He called himself a “translator”, referring to his gift at empathising with the thought of others and making it accessible to others. And indeed it was through him I met or took as thought companions the likes of John Henry Newman, Bernard Lonergan, Karl Rahner, Flannery O’ Connor and Pierangelo Sequeri. But a good translator is above all a good listener. I know of few people so capable of situating themselves in the needs of their audience, with a combination of spirituality, theology and humanity that always seemed to hit the mark. Those gifts led him far and wide, Australia and New Zealand included. Perhaps the clearest thread to his thought is found in the theme he turned to explicitly in recent years but which underlies his whole life in its interaction with literature and the arts: the imagination. Strongly critical of that common misconception that what we imagine is “only” fantasy he spoke of this “wavelength” within ourselves, deeper and truer than thought, which allows us get beneath the surface of ourselves (and a superficiality unworthy of human living), to grasp and shape who we are, and what we can become. Perhaps this is why he counted poets, artists and musicians amongst his friends, aware of how much the world needs them. “One of the blessings or gifts of art right through the centuries has been to wake people up to realities bigger and deeper than their usual everyday selves, and we need that again badly.” (MP Gallagher in a recent podcast on Imagination and Spirituality for the Irish Jesuit website; cf., http://www.jesuit.ie/podcasts/imagination-spirituality/). He was an exceptional lecturer, a prolific writer, a gifted spiritual director, a much-loved rector and a fiercely loyal friend to his own. And it is this last trait I want to celebrate here. Others know more of his life and the Jesuits will recount officially who he was and what his legacy is. Mine is a personal tribute –perhaps best summed up in the words of my mother upon hearing of his death: “he was always on your side”. I feel blessed to have been taught by him – this companion of Jesus who for a while walked also by my side. Imagine in peace, MPG.